I started off with the Sungold tomato gazpacho. 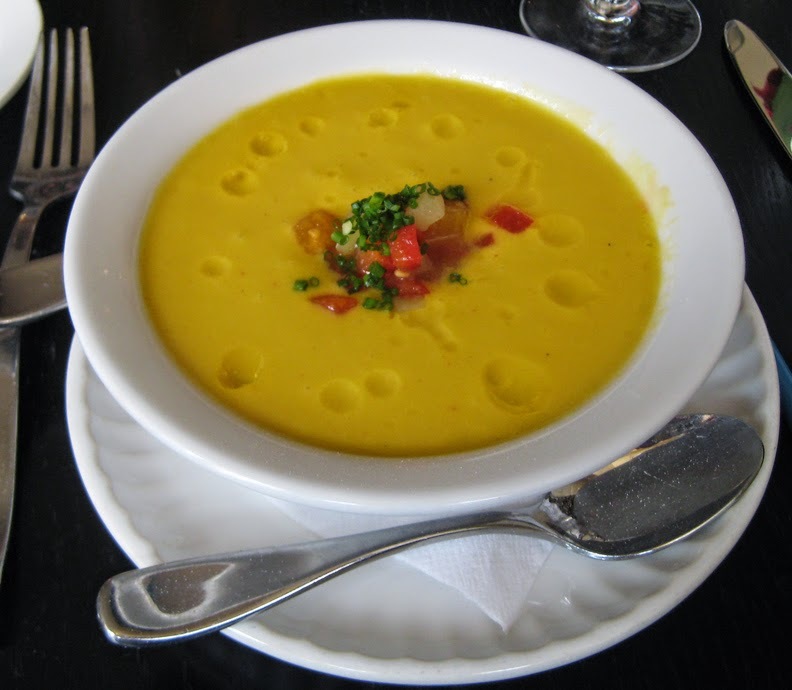 While I normally like the grainy texture of an unstrained gazpacho, the smoothness of Chef Kevin Perry's version elevated the summertime soup. The flavor was bright and sunny, like its color; a refreshing way to start a meal on a warm-ish evening. 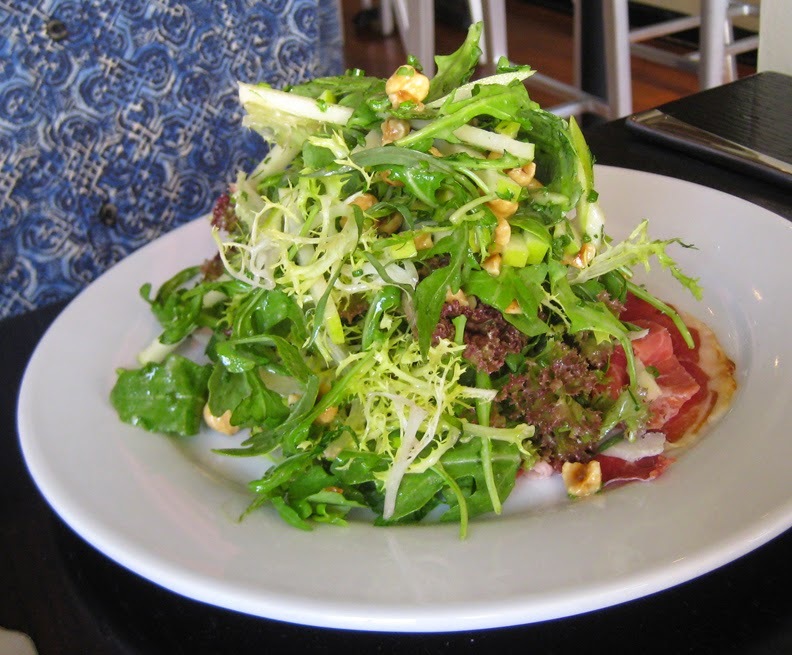 Mr Minx chose the jamon salad, a huge pile of mixed greens and herbs, Granny Smith apples, and toasted hazelnuts, tossed in a light tangy vinaigrette on a bed of thinly sliced cured ham. I couldn't decide if the salad needed the ham, or if the ham needed the salad; nevertheless, all of it was tasty and I was happy to help eat it. Because this event was raising money for Moveable Feast, I ordered an expensive entree, two crab cakes, with potato puree and cabbage slaw (one cake was available at half the price). 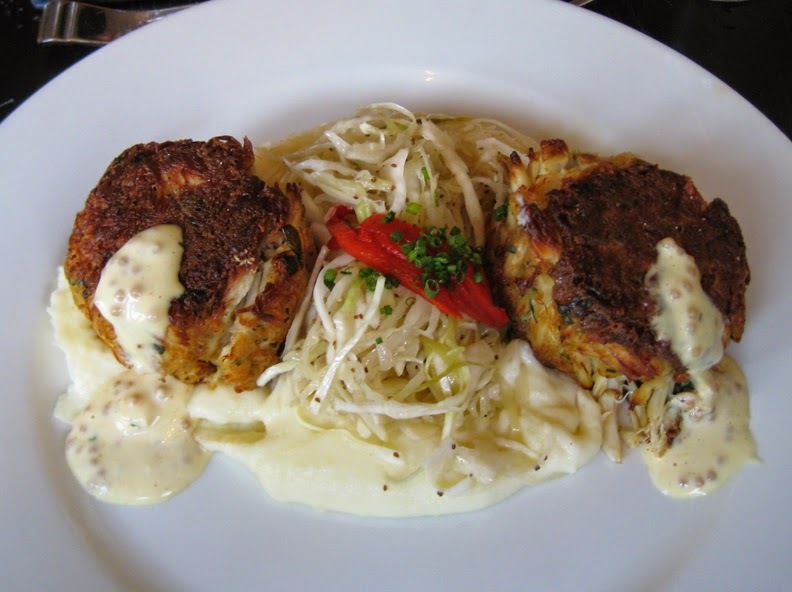 The crab cakes were excellent, pan-crisped and dressed with a wee bit of a creamy mustard sauce. The crab itself tasted like it had been freshly picked, and I could detect neither binder nor filler. The lightly vinegary slaw tasted like it was made by someone's grandma, and in combination with the potato puree reminded me of a summertime picnic. My handsome dining companion went for the sirloin steak, served medium rare, with more of that excellent potato puree. The menu listed arugula as a side, and our thoughtful server suggested that Mr Minx request something else, since he had just finished a large salad. 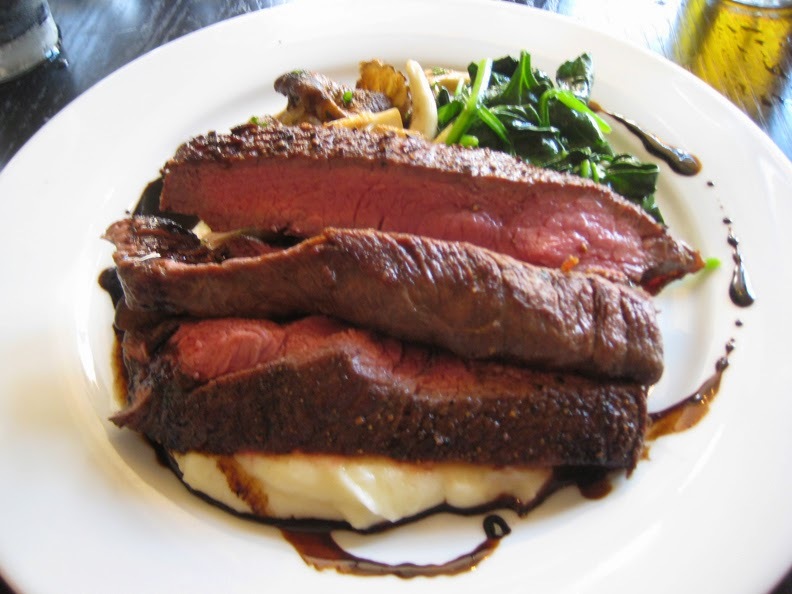 The chef provided sauteed spinach and a mix of mushrooms, both of which were appropriate accompaniments to the meat. And Mr Minx enjoyed every morsel, including the slightly sweet yet meaty-flavored sauce. The desserts that evening included cookies and milk and flourless chocolate cake, but we passed in order to pig out on ice cream at The Charmery, another Dining Out for Life participant. We enjoyed our meal at Liv2Eat, and the service was friendly and thoughtful. What more can one ask? Parking is a bit of a challenge in that neighborhood, because it's largely residential, so you may have to park around the corner or a couple of blocks down the street and walk a bit. It's well worth it, and burns off a couple dozen calories in the process.